Gemini, the Twins, is the first sign of the Air triplicity and the third sign of the tropical zodiac. The key phrase for Gemini is "I think". It is a sign of lively communication, wit and breezy exchange of ideas, gossip and intellectual matters. In Gemini, the soul force develops intellect in order to comprehend the universe. This karmic stage is concerned with information, communication, and creative writing. 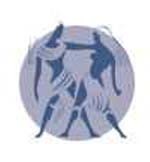 Gemini needs to express ideas and share information with others. The mature Gemini becomes a serious scholar, writer and researcher. The immature Gemini is a gossipy talker, nervous and high strung. It is the sign of the hands and fingers and these individuals receive pleasure by using them, either in their work or even while they talk. Gemini's anchor points are words. Their sense of safety is by talking and responding well to emergencies. Their memories are excellent. They react intellectually to everything they experience and yet are quite moody, hence their dual natured personality. Geminians must work to acquire calmness of mind as well as body. They might begin well by learning to eat slowly and avoid using their hands in conversation and argument. This discipline will enable them to maintain control even during angry moments. Geminians are described as the "perennial teenagers" as they always look younger than they really are. Their alert eyes are always full of humour, with a thin nose, upturned like a child's and a light gait with a long neck. As a rule, they are adept with mechanical devices, working with jewellery, arts and crafts, or doing repair work. Gemini talents also include design, artwork and graphics, interior decoration, magic and illusion and music. Each sign of the zodiac has external, internal and structural rulership. Externally, Gemini rules the shoulders and upper arms. Internally, the breath, nerve fibres, thymus gland and lungs, trachea and bronchi. Structurally, the clavicle, scapula and humerus. This double sign portends the native suffering from two diseases at the same time. The pathological action of this sign is nervousness, negativity, passivity, or even restlessness. Tuberculosis, asthma and anaemia are common to the nativity. Vulnerable parts of the body are the arms, hands, fingers, lungs and nervous system, especially the sense of hearing. Respiratory problems and various nervous conditions are common Gemini complaints which are benefited with the orange rays. Gemini is traditionally considered a barren sign. Gemini rules the colours yellow and light blue. Gemini people also respond well to the healing ray of orange. The birthstone for Gemini is the agate, a stone of many colours. The amethyst and the aventurine are also geminian in nature. Remember only to wear these stones if you want to bring their influence into your life. More about Gemstones and Astrology. Lilac, azalea, lily-of-the-valley, lavender, myrtle and sweet pea. Stress, tension, over-exhaustion, forceful, argumentative. Used in the treatment of colds, flu and headaches. Benzoin, bergamot, mint, caraway, dill, lavender, lemongrass, lily of the valley, peppermint, sweet pea. A mental sign requires oxygenating foods like fresh fruits and vegetables. Gemini benefits through orange-coloured foods like oranges, pink grapefruit, peaches, apricots, etc., which help decongest the lungs and prevent mucus. Avoid milk which produces mucus. Eat plenty of potassium-based foods like fruit and avoid salt. Do not eat heavily before bedtime. Pay careful attention to the breathing, which should be regular and deep. Get lots of fresh air to avoid sore throats, as well as plenty of water to prevent accumulation of mucus. Carrot juice is the vegetable drink of choice. Lentils are the beans of choice. Recuperation comes through mental relaxation and change of scenery.